and mild steel solutions to the construction sector. 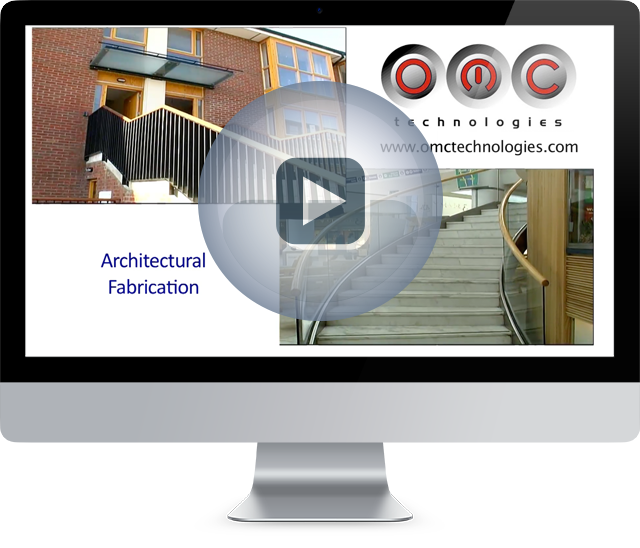 OMC Technologies provide a full range of stainless, aluminium and mild steel architectural and semi-structural products to meet the needs of a broad range of applications in the Construction, Residential, Commercial, Industrial, Pharmaceutical, Healthcare, Security, Meat & Fish Processing Sectors and for Local Authorities across Ireland and the UK. Our product catalogue includes Balustrading & Handrails, Feature Staircases, Balconies, Canopies, Street Furniture, Platforms, Facades, Glazing, Feature Works & Sculptures. OMC provide a closed loop service from initial design review, provision of full design & fabrication drawings, engineering calculations including loadings, complete fabrication, polishing, degreasing & passivation & electropolishing, through to complete site installation & commisioning by our team of qualified and experienced fitters. Our business and manufacturing procedures are under constant review. Heavy investment in capital equipment gives us total control over the complete manufacturing process. OMC have provided Architectural solutions to the following leading customers/projects: John Sisk & Sons, John Paul Construction, Walls Construction, PJ Hegartys, BAM, Bennetts, Clancy Construction, Duggan Brothers, Apple, Eric Parry Architects, Scott Tallon Walker Architects, Aviva Stadium, Croke Park, Dublin Airport T2, Athletes Village London, Royal Arsenal, Grand Canal Theatre, Cardiff Library, Primark Stores in Frankfurt/Gelsenkirchen/Karlsruhe/Berlin, Pembroke/Carrington/Ferrybridge Power Stations UK, Pfizer, Dew Valley Foods, Diageo, Arrabawn Coop, Kerry Group, Allied Beef Producers, Google, McDonald’s, Irish Prison Service & Local Authorities. OMC have been leaders in the metalwork industry for over 30years which enables us to provide our customers with the highest quality and standards. OMC Technologies employ direct staff who are appropriately qualified and who undertake continuous in-house training and development to meet the ever changing demands of our clients. All products are fully compliant with relevant industry standards including CE Marking, BS & EN Codes.